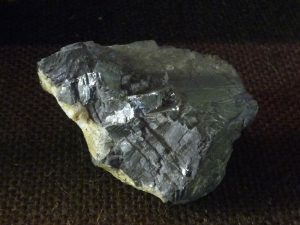 Galena is a grey mineral and the chief source of lead. This piece comes from the bleak windswept moorland of limestone and sandstone around Greenhow village. Lead mining was an ancient industry in the Greenhow-Grassington area and the mines were given romantic names: Sunside, Prosperous, Providence, Merryfield. Mills were built alongside streams with a ready supply of water, bellows were introduced, and the whole process became altogether more industrial and sophisticated. Providence Smelt Mill was built in the 1780s at Brandstone Beck, near Greenhow, and is a Scheduled Ancient Monument. Conditions of working were unhealthy and dangerous. In Ashfold Gill, the main vein (Providence Vein) was in gritstone and shales, which brought the associated problems of bad air and silicosis. Poor ventilation along with the dust, damp and fumes of explosives and foul air could result in severe chest and eye troubles.